Awhile back I shared how to clean and dry acorns so they can be used - bug-free - for crafting and decorating. If the acorn is nature's symbol for fall, then pine cones are winter's. So, now it's time to talk about pinecone decor and how to clean and dry them so you can use them in all of your late fall and winter decor including pine cone wreaths, table-scapes, garland, etc. 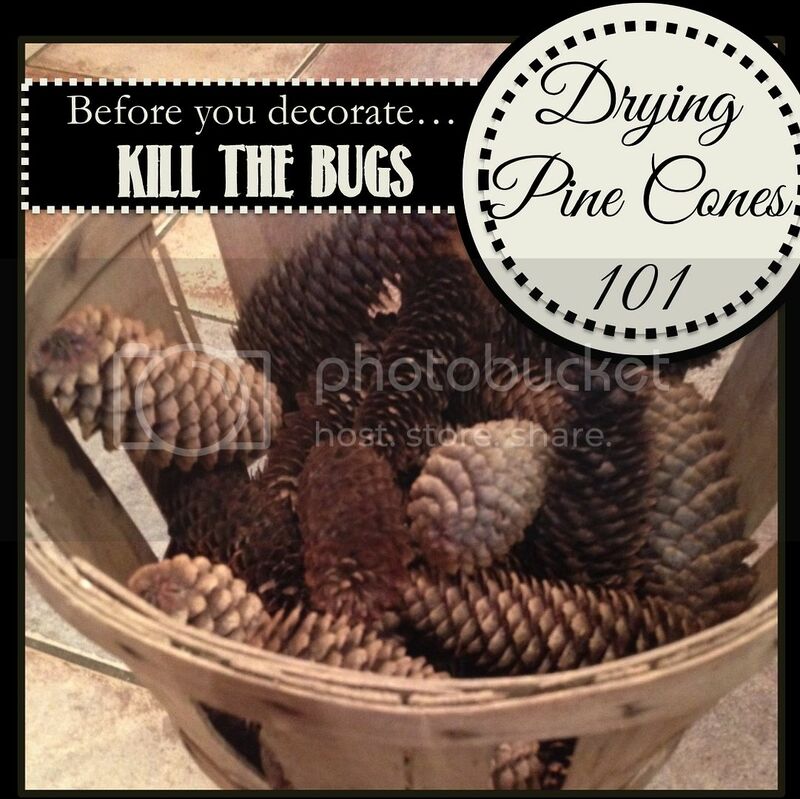 The process to dry pinecones is very similar to acorns in that you want to bake them to kill off any bugs that might be making a home in your next craft project. Unlike acorns, however, you do not want to wash them before you dry them in the oven. Pine cones close up when they are wet and are open when they are dry...and you definitely want the scales as open as possible when using them for crafting and decorating. So just leave the pine cones dry, put them on a foil-covered baking sheet and spread the pine cones out in a single layer. Bake them in a pre-heated oven at 200 degrees for about 20-30 minutes. Now anything living in there won't come crawling out. You can leave them like this - but I prefer to spray them with a little acrylic sealer to give them a little sheen and to protect them a little more as they are pretty fragile. Now you're ready to make some pine cone decor. I have lots in the works with my collection of pine cones so be on the lookout. Here's a little sneak peek of some pine cone crafts that I plan on sharing on the blog in the next few weeks. Notice how the pine cones are open on the left...the same pine cones on the right after soaking have started to close. Mini pine cones are my favorite! How do you like to decorate with pine cones? Share your favorite projects in a comment below or link up a project or two at the Link It or Lump It Link Party!